Whether it's lost treasure or missing persons, the Fargos find themselves in a heap of trouble every time . . . When Texas oil baron Charlie King contacts Sam and Remi Fargo he has an unusual request. He hired an investigator - and good friend of the pair - to locate his missing father in the Far East. But now the investigator has vanished. Would Sam and Remi be willing to look for them both? Though something about the request doesn't quite add up, Sam and Remi agree to help out. It's a journey that takes the Fargos to Tibet, Nepal, Bulgaria, India, and China. They get mixed up with black-market fossils, a centuries-old puzzle chest, the ancient Nepali kingdom of Mustang, a balloon aircraft from a century before its time . . . and an extraordinary skeleton that might turn the history of human evolution on its head. Oh, and not a few unfriendly people with guns and itchy trigger fingers . 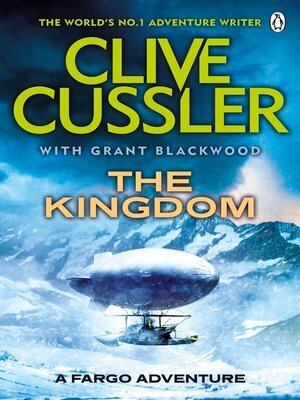 . .
Clive Cussler, author of the celebrated Dirk Pitt novels Treasure of Khan and Valhalla Rising, presents the third novel in his newest series, following the adventures of treasure hunters Sam and Remi Fargo. The Kingdom follows Spartan Gold and Lost Empire. The bestselling 'Grandmaster of Adventure', Clive Cussler has thrilled millions of readers with this gripping, fast-paced stories based around treasure-hunting, action and conspiracy. As well as the Fargo series there are also the NUMA and Oregon Files series, the Dirk Pitt stories (which started it all) and the Isaac Bell adventures series. The other titles in the Fargo Adventures series are Spartan Goldand Lost Empire which are both available from Penguin.